If you are looking for a fitness park in Davie, FL that you can exercise and enjoy the outdoors then have to check out Vista View Park. 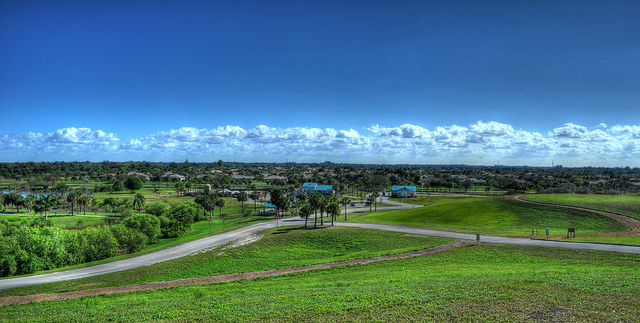 Vista View Park is a 272 acre park located off of SW 142nd Ave just North of Orange Drive. The park is great for fitness enthusiasts with all of the outdoor athletic challenges you have to choose from inside the park. There is a half-mile loop trail with several fitness stations. The stations include a balance station, lower body warm-up, upper body warm-up, bench stepper, standing push-up, upper body strengthening station, forearm rolls, torso stability station and a lower body stretching station. Not only does this park have a fitness trail it also has hills and paved pathways that you can walk, run, skate or ride your bike up and down. Once you get to the top of the hill you will be able to see the beautiful city below. While there you will most likely see many other fitness enthusiasts challenging themselves on the hill, pathways and fitness stations. The park also has basketball courts and a 2.1 mile horse trail. Pets are welcome, but if you are going to bring your dog they have to be on a leash less than six feet long. This park offers you a great way to stay in shape while enjoying the beautiful South Florida sunshine! This park is a great fitness park in Davie, FL with many other fun things to do. There are two playgrounds that are both covered with shade canopies. The larger playground is a Universal Access playground. Both playgrounds have plenty of fun things for the children to do. The park also has an airstrip for electric radio-controlled planes and glider pilots. For those who enjoy fishing you can fish on the fishing piers or on the shoreline. Admission to Vista View Park is free on weekdays. Weekends and holidays admission is $1.50 per person ages 6 and up, $8.00 maximum charge per car (six to nine passengers). This is an inexpensive way to exercise while enjoying the outdoor scenery in this park in Davie, FL. The park hours are 8 a.m. To 6:00 p.m. November 2, 2014 through March 7, 2015. 8:00 a.m. to 7:30 p.m. March 8, 2015 through October 31, 2015. The park is closed the day after Thanksgiving and Christmas Day. 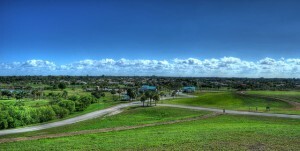 Vista View Park is nestled between Imagination Farms in Davie and Riverstone in Davie. These developments offer some of the nicest Davie luxury homes on the market. A short bike ride from single family home developments in Davie such as Shenandoah and Poinciana Parc. There are lots of homes for sale in Davie near the park contact Teri a leading Davie Realtor for details.